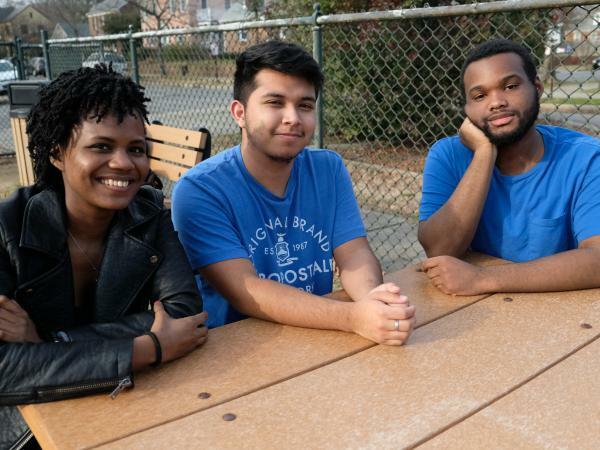 Summer Campbell (from left), Geovanny Mejia and Justin Daniels, students at Thomas Jefferson High School in Richmond, Va., are talking about the recent scandals unfolding at their state Capitol. In Richmond, Va., the beginning of February feels like a long time ago. On Feb. 1, a racist photo in Gov. Ralph Northam's 1984 yearbook surfaced. Immediately, some lawmakers called for his resignation. Northam has denied that he appears in the photo where one man wears blackface and the other a white Ku Klux Klan robe, but he has admitted to wearing blackface in the early 1980s while dressing as Michael Jackson. Still, Northam has made it clear that he is not going anywhere. And Attorney General Mark Herring, who has admitted to wearing blackface the same decade, hasn't indicated he will step down either. It's been a roller coaster of a story that confounds many across the country. That includes teachers in Virginia classrooms trying to talk to their students about the scandals embroiling the top elected officials in the state. "I just want to know ... why anyone would think it was a good idea to put that photo in that yearbook?" asks Justin Daniels, an 18-year-old senior at Thomas Jefferson High School in Richmond. He and some friends from school have been talking a lot about the news that has consumed their city for the past week and a half. Daniels is African-American, like a majority of the students at Thomas Jefferson. One thing they're pondering: whether Northam's and Herring's decisions to put shoe polish and brown makeup on their faces 30 years ago could be chalked up to youthful indiscretion. "I'm 16 years old and I know not to do that," says Hannah Clark. She wants to see Northam resign, pointing out he was an adult when he dressed in blackface as Michael Jackson. "Now, I know that the time period might be different, but I don't want to create excuses for this man because he was a man at that point," Clark says. "He should have known not to do this." 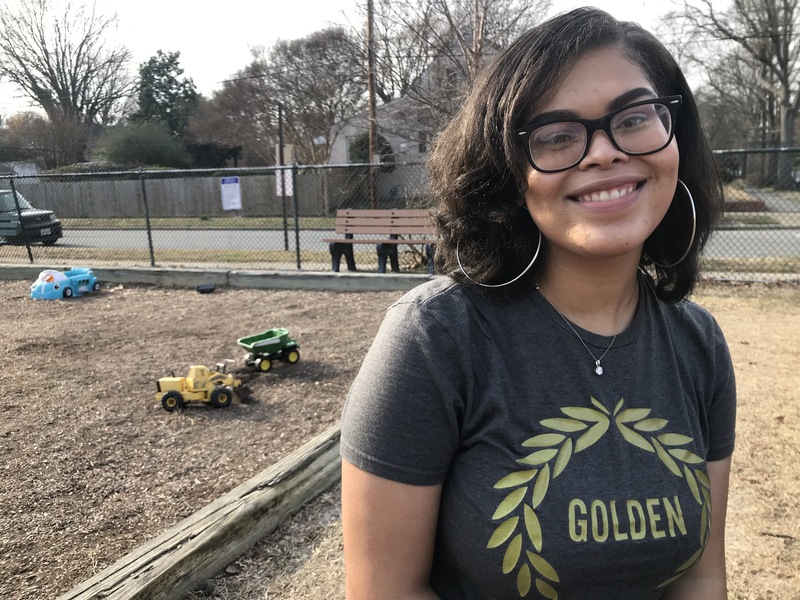 Shannon Williams, a student at Thomas Jefferson High School in Richmond, Va., says she is hesitant to call for Gov. Ralph Northam and Attorney General Mark Herring to resign, but not because she thinks blackface is OK.
Their classmate Shannon Williams is hesitant to call for Northam and Herring to resign, but not because she thinks blackface is OK. "Even though what they have done is wrong — I strongly believe what they did was wrong — and even though they 'apologized' for it, I believe that the people that will come after them in office probably have done worse things." Another student, Geovanny Mejia, says if their white friends dressed in blackface today, they'd probably get beaten up. "I'm not sure why it took us this long to get to that conclusion that it is bad to do blackface," Mejia says. "Like after all, it was just used to ridicule black people. And like, why would it even cross your mind that that would be a good thing to do, like, 'Haha, it's so funny?' "
Daniels, Clark, Williams and Mejia are all taking the same art class. Their teacher, Stuart Harnsberger, has been working Richmond's current events into class. "I think the vast majority of the class knew what blackface was, or is," Harnsberger says. "I don't know that too many had seen an actual example." He showed his class the yearbook photo and a video of a minstrel show and says most of the students seemed shocked and alarmed. "I think each time that we have these discussions in class, I'm able to earn a little bit of trust from students," Harnsberger says. "I'm not going to shut them down." He says he makes it clear that everyone's opinion is worth hearing. A spokesperson for Virginia's Department of Education said it is "preparing a list of vetted resources to help teachers with classroom discussions related to the events of the last week." The American School Counselor Association also has a resource page to help school counselors and educators support students when there are troubling current events. As for whether Harnsberger thinks his conversations with students will shape how they think about their own actions going forward? He hopes so. "I was walking around in the cafeteria and a student pulled out her phone and showed me an image of a Gucci sweater that indicated somebody with blackface on the sweater. It apparently got pulled from Gucci," Harnsberger says. "And she was able to make a direct connection between what we're talking about in class and what she saw on her phone." Nick Cenname, who teaches eighth-grade civics and economics in a neighboring school district, says he felt like he and his students couldn't ignore all the noise coming out of the statehouse, just 15 minutes away. "I let them look at the photo and they're like, 'Wow, that's pretty racist.' " Cenname says these conversations are helping engage students who might not otherwise be interested in what's happening in state politics. "One kid told me he downloaded CNN on his phone just to see what was going on with the governor of Virginia," Cenname says. "If scandal is what it takes to get you involved in current events, then that's fine." Daniels, the student from Thomas Jefferson, says he is disappointed in how little progress the country has made when it comes to race. "I feel like as a whole in America, we've been putting off the conversation and people keep saying that we can't get over racism. But we've never really talked about it openly," Daniels says. "Because it feels like people are too scared to talk about it because it'll, I guess, open up old wounds that really have never healed? I mean, is it really an old wound if the wound is like fresh every day?" He's not exactly sure where the conversation should go next. The most important thing, he says, is that it keeps happening. Copyright 2019 WCVE. To see more, visit WCVE. After the racist photo in Virginia Governor Ralph Northam's 1984 yearbook was made public, both he and the state's attorney general, Mark Herring, admitted to wearing blackface years ago. As the scandals roil on, teachers and students in and around the capital of Virginia, Richmond, are talking it through in classrooms. WCVE's Megan Pauly has this story. MEGAN PAULY, BYLINE: Justin Daniels is 18 and in his senior year at Thomas Jefferson High School in Richmond. JUSTIN DANIELS: I just want to know why anyone would think it was a good idea to put that photo in that yearbook. PAULY: He and some friends are sitting around a picnic table talking about the news that has consumed their city this week. UNIDENTIFIED STUDENT: Why he didn't check to see if it was in there and was like, hey, don't put that in there. PAULY: Justin is African-American, like most of the students at Thomas Jefferson. One thing they're asking themselves, whether Northam and Herring's decisions to put shoe polish and brown makeup on their faces 30 years ago could be chalked up to youthful indiscretion. Hannah Clark says no. HANNAH: I'm 16 years old, and I know not to do that. PAULY: She wants to see Northam resign, pointing out he was an adult when he dressed up as Michael Jackson in blackface. HANNAH: Now, I know that the time period might be different. But I don't want to create excuses for this man because he was a man at that point. He should have known not to do this. PAULY: Geovanny Mejia, another student here, says if one of their white friends did that today, they'd get beaten up. GEOVANNY MEJIA: I'm not sure why it took us this long to get to that conclusion that it is bad to do blackface. And, like, after all - like, it was just used to ridicule black people. And, like, why would it even cross your mind that that would be a good idea to do and, like, oh, ha, it's so funny. PAULY: Justin, Hannah and Geovanny, they're all taking the same art class. Their teacher, Stuart Harnsberger, has been pulling Richmond's current events into his lesson plans. He shows me a minstrel video he shared with his students. STUART HARNSBERGER: "Sand Dance" - yep, there it is. HARNSBERGER: I think the vast majority of the class knew what blackface was or is. And I think - I don't know that too many had seen an actual example. PAULY: He says most of his students seemed shocked and alarmed at what they heard and saw. HARNSBERGER: I think each time that we have these discussions in class, I'm able to earn a little bit of trust from students because I'm not going to shut them down. And we're trying to operate on the idea that anybody's opinion is worth hearing. PAULY: I asked him if he thinks the conversations will shape how students think about their own actions going forward. HARNSBERGER: That's the hope. You know, for example, this morning I was walking around in the cafeteria. And a student pulled out her phone and showed me an image of a Gucci sweater that indicated somebody with blackface on the sweater. And it apparently got pulled from Gucci. PAULY: Nick Cenname teaches eighth grade civics in a neighboring school district. He says he felt like he and his students couldn't ignore the noise from the state capital just 15 minutes away. NICK CENNAME: So I let them look at the photo. And they were, like, wow - like, that's pretty racist - you know, after we had the discussion about what blackface was and stuff. And then when I told them who he was, they're like, whoa. PAULY: And, he says, the conversations are helping engage students who might not otherwise care. CENNAME: One kid told me he downloaded the CNN app on his phone, just to see what was going on with the governor of Virginia. And I was like, that's great, man. If that's what it takes for you - if scandal is what it takes to get you involved in current events, then that's fine. PAULY: Justin Daniels, the senior from Thomas Jefferson, says he's disappointed with how little progress the country has made when it comes to these issues. JUSTIN: I feel like as a whole in America, we've been putting off the conversation. And people keep saying that we can't get over racism. But we've never really, like, talked about it openly - like, because it feels like people are too scared to talk about it because it'll I guess open up old wounds that really have never healed. I mean, is it really an old wound if the wound is, like, fresh every day? PAULY: He's not exactly sure where the conversation should go next. The most important thing, he says, is that they keep having them. For NPR News, I'm Megan Pauly in Richmond, Va. Transcript provided by NPR, Copyright NPR.